Sarab Loh Ji Ki Saadaa Rakshiya Hamnay: Boycott Bollywood NOW!!! Firstly, I apologise for not posting these past few days. I guess you can call it "spiritual breakdown". Anyways, I will be recuperating today, starting with some seva later at the temple.The topic I want to talk about, might not be so new to most of you.however, There is still a large number of sikh youth(especially in singapore)I suspect are aloof about this problem. It has to do with India and Bollywood's potrayal of sikhs as comical figures in the film industry. Sikhs are commonly played by comedians in bollywood movies. From past experience, I can recall Johnny Lever(Bollywood Comedian) dressed up like a sikh in past hindi movies, acting like an idiot,and people laughing at him.It gives the perception that all sikhs are like that. Also, in "Mohabbatein", Anupam Kher, another comedian, is potrayed as a sikh, and he is made to wear a "patka"(children's head covering), although the gaffer is in his 40s'.He is made to wear colourful clothes, shirt with shorts above his knees, and suspenders, also a bowtie if I remember. All a recipe for a clown. I admit sometimes sikhs are potrayed as heroic characters too, but usually more like Indian government puppets, which is a different topic altogether. If that was not enough, sensitive sikh jokes are constantly circulated in SMSes in India, and If this continues, It won't take much time for them to reach our shores too.People read these and laugh behind our backs. I have had personal experiences at the restaurant too. 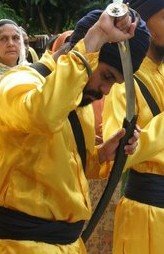 Sikhs have made great sacrifices for the well being and independence of India. When Ahmed Shah Abdali used to abduct hindu mothers and sisters, it was the brave sikhs who, at 12 midnight, used to terrify Abdali's forces and rescue those hindu sisters and mothers. Not for us, they would be reading the Qur'an today.However, in this present day, 12'0'clock jokes about sikhs are all too common. Just google it and you'll know what Im talking about. The 9th guru of the sikhs, Guru Tegh Bahadur, gave his head for the sovereignity of the hindu faith.For the independence of India, 121 revolutionaries were hung by the rope, out of which, 93 were sikhs! Sikhs are a mere 2% of India, but a backbone of its defence forces. Punjab is India's most profit making state, and Sikhs form its majority. Despite all these achievements we have done for the well being of India, its media still makes fun of us, still treats us as jokes, still treats us as 2nd class citizens.I know, you're gonna say,"Well that's India, this is Singapore. "I say, your conscience is dead.I don't know what to say to you, who, shamelessly watches bollywood movies, looks up to their actors/actresses as idols, and adopts their lingo and their latest trends, while , blatantly, your race is being made fun of, being laughed at, by those same people. Please watch the video below. It is a protest by SSF(sikh students federation)against the movie, shabad, which was released last year i think. It had some anti sikh propoganda in it.The person spreaheading this protest is Prabsharanbir Singh, a genius of philosophy(navigate to the right for his link). For those of you who do not understand punjabi, I have already explained the situation above. For those of you who dig Hindi movies, are bollywood fans, there is no excuse for you not to watch.Please don't turn it off because of your guilt. THIS IS THE TRUTH about what is happening to our people today. A protest in Chandigarh against the movie 'Shabad' and the portrayal of Sikh's in the Indian media and Bollywood. Alright, those of you, who have seen reason after watching the above demonstration,and want to do something about it, do email me. Especially if you're in Singapore, we can link up together to do something about these problems.Mere talk is not enough. check my work that will breakdown teh koothey they portray us as in films! im going to break into the industry iwth a graphic novel which will hopefully become a film!